Greg Schiano isn't the first college coach to leave his school in the midst of asking high school recruits to enroll. The cycle repeats itself every year. But for sheer dramatic value, nothing beats the scene Thursday at Don Bosco Prep in Ramsey, N.J. (coincidentally, the school that expelled a top football player for offensive tweets). Five assistant football coaches from Rutgers University were in the gym, prepared to seal the deal with two of the state's top recruits. They were just waiting for Schiano, who was late. 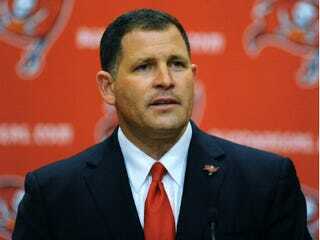 A couple of hours later, ESPN reported that Schiano agreed to coach the NFL's Tampa Bay Buccaneers. The next time they saw him, he was being introduced at Friday's news conference in Tampa, talking about trust, belief and accountability. As for the recruits at Don Bosco, and elsewhere, who trusted and believed that he'd be there if they committed to Rutgers? They should have known better. Coaches are always susceptible to leaving at a moment's notice, regardless of what they say in luring players. "It hit me like a ton of bricks," Bryan Brodie (father of Long Branch High offensive lineman Ryan Brodie) told the Courier Journal. "We had no idea whatsoever. He (Schiano) always told us he would be there, never planned on leaving and had his dream job. We understand it's a business and that things happen and change, but we were a little upset. We didn't see this coming. We bought into his philosophy and his program." Assistant coaches, like the five at Don Bosco who grew pale when the news broke, know the deal. Their security often departs when the head coach departs, forcing them into job-hunting mode as they wait and see if they'll be retained. Recruits and their families should recognize how the business works, too. The coach trying to woo them in their living room could have another school cooing in his ear at the same time. Even though Schiano had five years left on his Rutgers contract, he had been in place for 11 seasons already. He was a lifer compared with Todd Graham, who accepted his "dream job” at Pittsburgh in 2010 — and bolted less than one year later for his "dream job" at Arizona State. With National Signing Day rapidly approaching (Feb. 1), Rutgers' prized recruiting class has been thrown into uncertainty. Some players are reconsidering their decision, while others have already rescinded their verbal commitment. Coaches from rival schools are swooping in to pick over the Rutgers class like buzzards on roadkill. That's fine. But recruits need to remember that the coach could be gone in a year or two, no matter what he says. So their decision should be based on the school, the program, the tradition, the location, the facilities and just about anything else. Only then should the coach be factored in — if at all. Deron Snyder writes his "Loose Ball" column for The Root. Follow him on Twitter and reach him at BlackDoor Ventures, Inc.